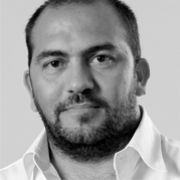 Ramzi is Executive Creative Director at MEMAC Ogilvy in Dubai. His agency has received acclaim at various awards ceremonies, including Agency of the Year at Lynx – (the Middle East's top awards show) as well as Effective Agency of the Year. On a global level, MEMAC Ogilvy has also won in Cannes as well as all the big international shows. Enough so that Memac Ogilvy Dubai is not Ranked in the top 15 of all Ogilvy Offices World Wide. Ramzi considers himself born in the creative department. Memac Ogilvy has been his “playground” since he was eight years old, where he could be found drawing and painting with an airbrush. However, post-education, he went on to another creative environment to hone his skills, the renowned Red and Yellow School of Logic & Magic in Capetown. After honing his creative skills, he worked at Ogilvy One in London and then found his way back to MEMAC Ogilvy in Dubai where he started as an Art Director before becoming Creative Director. Ramzi received his degree in Advertising Design from Lebanese American University in Beirut, Lebanon.